JIMS HR Club ‘Samanvay’ held a panel discussion on the topic 'Understanding HR, from here to where and why?' on February 6, 2016. The topic focused on challenges emanating from the current business turbulence and resulting in chaotic situation. The speakers were,Mr. 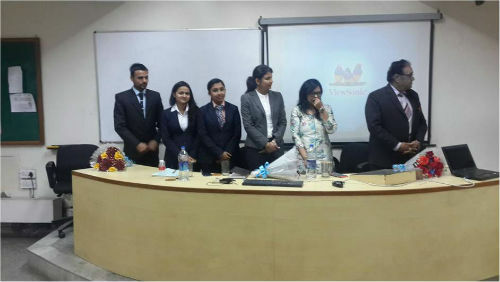 Yuvraj Singh, Assistant Manager – L&D, The Andragogy Consulting House; Ms Srishti Sharma, Unit HR Head, Shoppers Stop and Ms Preeti Sinha, Chief People Officer, Air Net Services. All three speakers shared their experiences from classroom to Corporate. The session began with the thoughts of Ms. Preeti Sinha. She shared how she perceives the Corporate world from a human resource manager’s perspective. She emphasised that business world is changing fast and now employee have become more knowledgeable, smart and aware of their rights. Now HR is not simply a functional area but has to support business as “Business Partner”. The whole business depends upon how the employees are being handled in the organization and that’s why human resource must be handle effectively. Ms. Srishti Sharma shared her own thoughts on her journey at Shopper’s Stop. She started her session by some icebreaker activities and explained various roles of people in HR. She said the “power of listening” is important to understand to explore in the field of HR. Further she also explained the nuances of HR function and how HR can play afar greater role. Mr. Yuvraj Singh discussed about how to fill that gaps in training the employees. He also shared stories from his professional life and how to handle work and related issues. The session opened up for students who came up with their queries related to choice of specialisation, role of technology,competencies of an HR person. The most important message for HR students was that they should opt for HR as chosen career not because of their love to interact with people but because they think we can handle people effectively. Preeti Sinha. She shared how she perceives the Corporate world from a human resource manager’s perspective. She emphasised that business world is changing fast and now employee have become more knowledgeable, smart and aware of their rights. Now HR is not simply a functional area but has to support business as “Business Partner”. The whole business depends upon how the employees are being handled in the organization and that’s why human resource must be handle effectively.